Jazz on the Tube is the biggest, organized and indexed, online collection of jazz videos on earth – and it’s free. We deliver great jazz videos to over 40,000 jazz fans (and counting) all over the world every day. We also maintain the most up-to-date online directory of jazz festivals, jazz radio stations and jazz clubs worldwide. We do this because we love jazz and the people who make it and the people who listen to it! 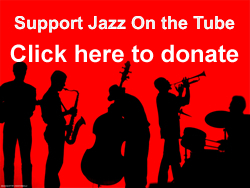 If you’d like to support our efforts, please become a subscriber (it’s free) and watch some great jazz videos and then go out and hear some LIVE music.